it definitely does what they say it will. Just got mine, we did a quick trial with what ever could find in the parking lot, bunch of twigs, dried palm leaves, husks, etc......after getting it started (a fire starter works better than paper) it boiled a kettle of water in 13 minutes with just a handful of stuff. amazing and nothing left but fine white ash is left....nothing else. Best 179 I ever spent for emergency preparedness or just everyday cooking. Once again , I am so pleased with this stove . So packable and light and the perfect survival stove . All my backpacking friends are impressed as well . Thanks again for such an outstanding product. Todd Albi has come up with another winning and innovative stove with the Silverfire Scout. 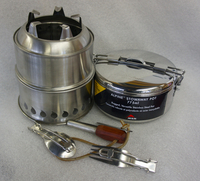 The Scout is the most versitile stove I have found for survival, tactical, and recreational use. For additional fuel versitility, the folks in my loop add a Varga Decagon alcohol burner which fits perfectly on the top of the inner firebox. In Alcohol configuration, the stove can be used extended in high wind or cold weather or collapsed in calm, warm conditions. The only drawback for tactical use is the bright silver finish. We have out Scout stoves coated with High Temp Cerokote as follows: pot support and MSR pot - 1500 deg high temp black, outer wall of top burn box, pot lid, and vent stand - 700 deg high temp FDE or OD (see photo) Another thing we recommend is a good multitool that has a pruner rather than a pliars as the main tool. The good multitools also have a knife and a fleem cut wood saw. This makes trimming fuel down to the right size quick and easy, a critical capability when time is of the essence. This stove meets all the requirements I have for a stove including fuel versitility and sustained fuel availability in the most extreme situations. Two thumbs up for the Silverfire Scout. I am ex Military and i have been in some cool places and I wish I had this little guy back in the day . Super efficient and puts out tons of heat and once going good very little to no smoke. I have other stoves but this kit is all you need . From first flame to boil full pot of water to cool enough to pack up was just under 30 minutes. That's not packing the stove full of sticks like they tell you to. I would like one in titanium and that would make it even better. Killer kit .